All the photos from this trip can be found here in Photo Lines. 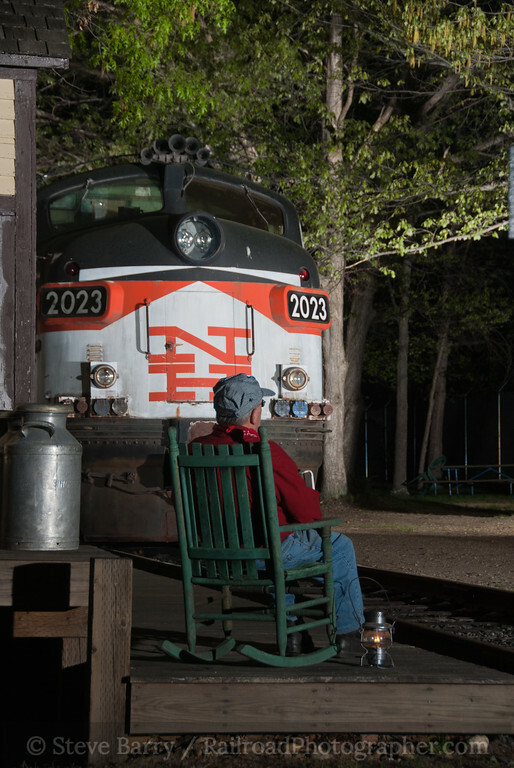 The Connecticut Eastern Railroad Museum in Willimantic asked me to come up with my lights and pit on a night photo session for -- not a railroad group, but a camera club! Intrigued, I agreed to do it, and plotted a two-day trip into the Nutmeg State with my brother Bruce and friend Mike Burkhart on May 14-15, 2011. 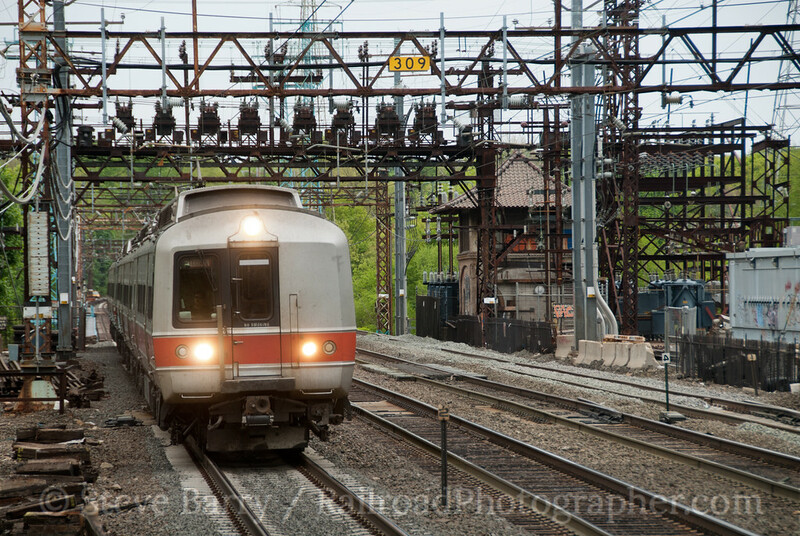 Our first stop would be along Metro-North at Cos Cob, where we hoped to get some of the new M8 cars that have just been put into service by the commuter railroad. Alas, we didn't get any M8s, but we did find some angles to work, including getting the classic ex-New Haven Railroad tower in the background (above). Connecticut Eastern Railroad Museum; Willimantic, Conn. Happy with that, we moved on looking for Shore Line East at Guilford. Alas, this commuter operator was running its weekend trains with leased Amtrak diesels, some of which had battered Shore Line East decals on the nose and some that didn't. We also caught a handful of Amtrak's Northeast Direct and Acela Express trains working between Boston and New York. Getting over to Old Saybrook, we just missed an Amtrak work train. A quick run up to Essex to check on the status of the Valley Railroad's new steam locomotive was thwarted when we discovered that Thomas the Tank Engine was in town. 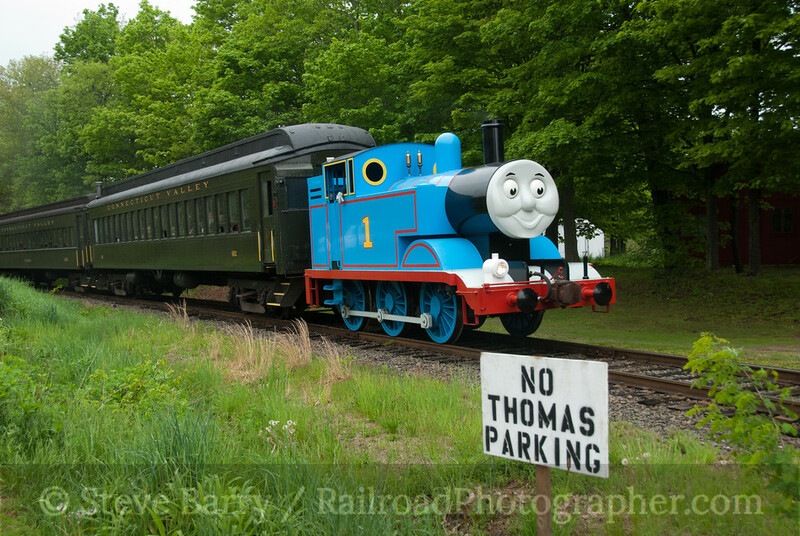 We found a neat shot along the railroad with a "No Thomas Parking" sign, but the little blue engine had made his last run of the day at this point. At the museum, we found coordinator Tom Nanos and an enthusiastic group that had never photographed trains before. We lit up a few station scenes featuring the museum's ex-Metro-North FL9 diesels, complete in New Haven paint. 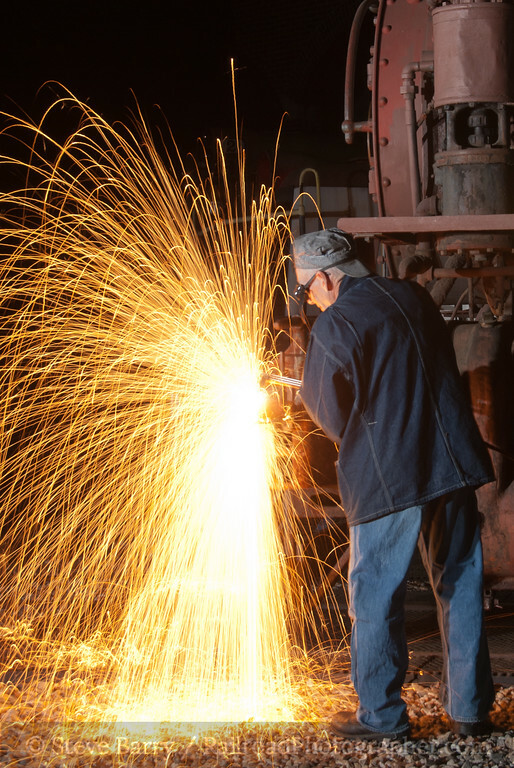 From there we headed over to the roundhouse for a multiple locomotive line-up, and finished off with the CERM's traditional "shower of sparks" night shot of someone grinding away at a steam locomotive (okay, the steam locomotive was not harmed; the sparks came from grinding a piece of metal that was clamped to the steam locomotive). All in all, the folks got about 30 opportunities to photograph different equipment from different angles, and the museum's "actors" who posed in the photos certainly brought the scenes to life. It was a great time. The next morning we were up early to shoot the Providence & Worcester as it made its way south along the Thames River. Our target was getting the train passing the U.S.S. Nautilus, the nuclear-powered submarine that's now a museum at the U.S. Coast Guard sub base in Groton. 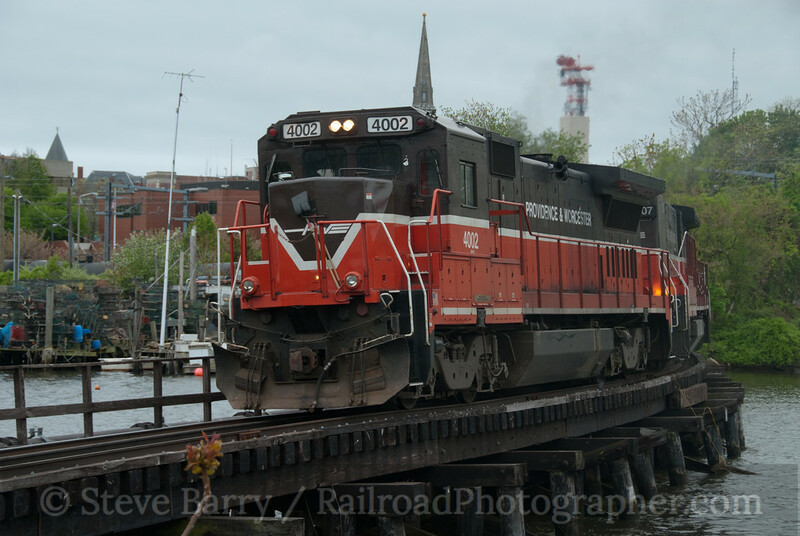 Clouds dogged the shot, but we were able to get the train there and again as it made its way to the interchange with the New England Central across the Thames in New London. A small trestle provided a good photo prop to get the train. We chased it back past the sub base and continued on one more stop at Mill Cove before breaking away. That shot of Thomas the Tank Engine was still on our minds, so we headed back to Essex and awaited the blue engine's next departure. Since the shot was better when Thomas returned, we hung around and got the inbound move for the shot showing how friendly Thomas's neighbors can be. The weather wasn't great and Shore Line East still wasn't cooperating (leased Amtrak power was still leading all trains this day), but we got some Amtrak and SLE at Westbrook and Guilford before heading west of New Haven and back onto Metro-North. We paused at Old Greenwich to shoot Amtrak and commuter cars, and finally got a set of the new M8s. But it was getting dark, so after a few trains we called it a day and headed home, wrapping up our visit to the Nutmeg State.